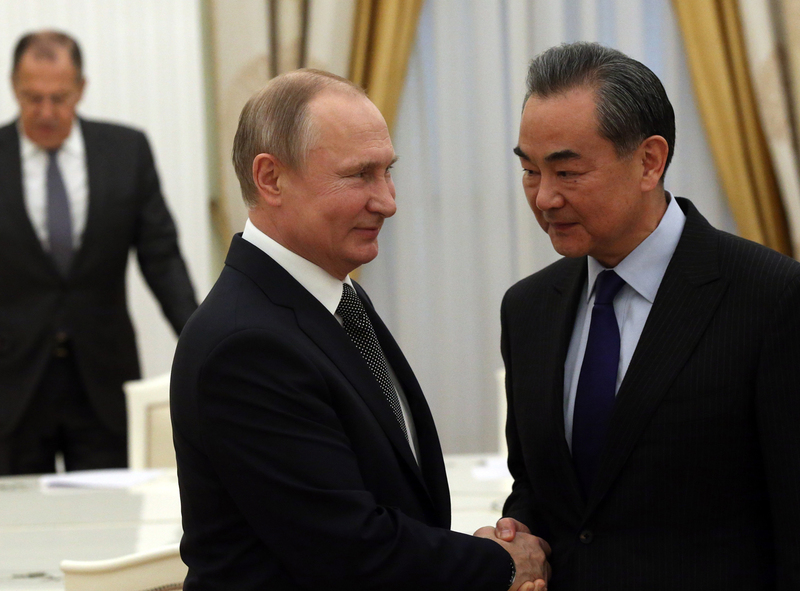 Russian President Vladimir Putin (center) greets Chinese Foreign Minister Wang Yi (right) at the Kremlin in Moscow, Russia, April 5, 2018. Shi Yinhong is the Director of the American Studies Institute at Renmin University and the Academic Committee of the School of International Relations. To commemorate the fifth anniversary of the China in the World podcast, Paul Haenle is interviewing five of the most respected Chinese international affairs scholars to discuss this important inflection point in U.S.-China relations. For the fourth episode in this series, Haenle spoke with Shi Yinhong, Director of the American Studies Institute at Renmin University and the Academic Committee of the School of International Relations. Shi points to two important turning points in China’s shift to a more assertive foreign policy: the 2008 global financial crisis, which made it clear that China’s economic development was an important engine for global growth; and Xi Jinping’s rise to power, which signaled China’s more ambitious international approach. Shi says China has undertaken a number of new foreign policy initiatives with regard to the South China Sea, relations with Russia, and the Belt and Road Initiative. Despite these developments, China is now at a stage where it should assess the successes and failures of its recent policies. Beijing must be willing to be flexible and adjust its future international engagement to reflect the realities of the evolving geopolitical environment. At home, Chinese policymakers should implement much broader and deeper reforms to ensure stable economic and financial systems. This includes increasing market access, giving equal treatment to private and state-owned enterprises, and addressing core demands laid out in the USTR Section 301 Report. Time is running out, Shi argues, and China needs to act quickly before it becomes too difficult to implement further economic reforms. Shi says that there is a need for “prudent pessimists” to think through urgent issues in the bilateral relationship and keep it from continuing down a dangerous path.